The European fire ant collecting sugars from a peony. Quick History: In the winter of 2010/11 I received some ant specimens for identification, via Agriculture Canada, that were collected last summer in North Vancouver. I identified these as the European fire ant (Myrmica rubra) and thus document the presence of this ant in British Columbia . A few years ago, specimens of an unidentified ant species were sent to Jack Longino, which he determined to be the European fire ant. Unfortunately, the locality information was lost, with one person in the chain of handling guessing they either came from Victoria or Richmond. It does not appear possible to resolve the locality of this earlier identification. In June 2011, I travelled down to Vancouver to examine the locality from which the North Vancouver ants arose, and examine complaints from a community garden in Burnaby which subsequently turned out to also arise from an infestation of the European fire ant. The European fire ant is an invasive species that was introduced around 1900 into the Boston area. It did not spread extensively for several decades, although it was reported in Quebec back in 1915. Perhaps about 30-40 years ago it began to significantly expand its range and was reported in southern Ontario. In the past 15 years it has moved into the Maritimes (Groden et al. 2005, Wetterer and Radchenko 2010), although until this identification all localizations of the European fire ant in North America have been below 49° N.
While some ants in British Columbia (e.g., red wood and thatching ants) can be aggressive and bite, they are usually just an annoyance and encountered as single or a few ants. The European fire ant, however, swarms rapidly when disturbed, and stings. Unfortunately it likes to live in lawns and gardens. It can make standing on grass impossible as nests often form at densities greater than 1 per square metre. For example, I counted 4 nests within 1 sq metre in the backyard of one North Vancouver residence in June of 2011. While the sting isn't as painful as a wasp (for most people), you are often suddenly stung simultaneously by many of these ants before you realize you are in contact with them. Some people, and one example has already emerged in Burnaby, react more seriously and experience painful and significant swelling requiring medical care. If these ants get into parks or campgrounds, they can render them effectively unuseable. 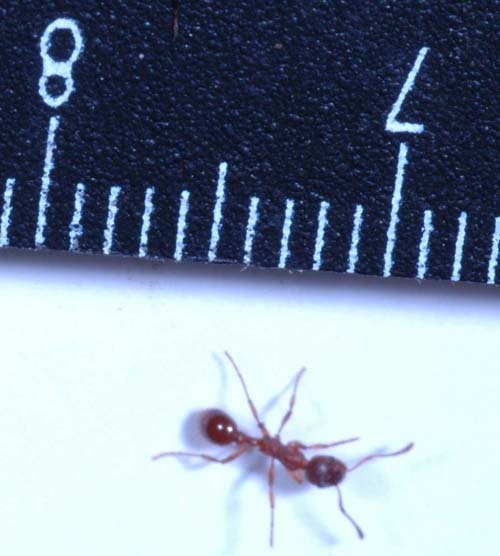 This website is intended to maintain a record of this ant in British Columbia, provide some information regarding its natural history, and pass along what is known with respect to control.